Trusted Long Term Partners to Customers and the Manufactures We Represent. We cover Southern California Counties of Los Angeles, San Bernadino, Orange, Riverside, San Diego, Imperial, Ventura, Santa Barbara, Kern, San Luis Obispo, Southern Nevada and Arizona. Aerovox is a leading manufacturer of high reliability film capacitors for industrial, medical and specialty applications serving original equipment manufacturers (OEM) and distributors worldwide. Aerovox is a leading manufacturer of high reliability film capacitors for industrial, medical and specialty applications serving original equipment manufacturers (OEM) and distributors worldwide. Customer oriented support in engineering design and components. Partnering with electronic and mechanical engineers. Support from R&D to production. AgileSwitch switch drivers are offered in industry standard form factors and interfacing. Leading provider of film capacitors for industrial, medical, military/aerospace and specialized applications serving original equipment manufacturers. Powertip Technology Corporation, established in 1991, began operation by instituting time-honored ideals that still largely guide this company today. Powertip continues to reinforce the principles of being a leading display manufacturer to industry. Powertip consistently strives to uphold exceptionally high standards concerning technology and product development while remaining deeply attentive to quality, on-time delivery and remaining highly price competitive. Current and Voltage Transducers. LEM products fall broadly into multiple areas of application and are used within general industry, automotive industry, for railway and trackside applications, energy measurement relating to railway on-board applications, energy & automation, battery monitoring, and in Wi-LEM – wireless sub-metering networks that measure energy consumption. Piezo Ceramics Components. Highly customized piezoelectric assemblies, Piezo stack, and stripe actuators. All types of piezo transducers. Custom ultrasonic parts, nebulizers. Piezo components as cylinders, rings, discs, plates, etc. 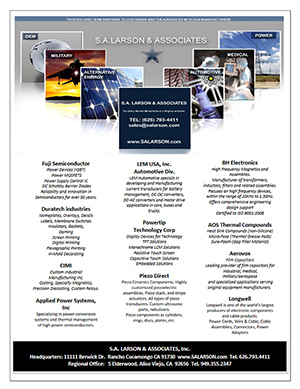 Specializing in power conversion systems and thermal management of high power semiconductors.